1. The Army Boxing Association Inter Unit Team Boxing Championships Final will take place at the Combat Sports Centre in Aldershot on 10 May 2018. 2. The Championships will take the form of an open knock out competition for all teams, this includes teams from NI, Germany and Cyprus. Each team being drawn in a straight draw after each round of the competition. 3. The box by date of each tie of the draw is set by the Secretary of the Army BA and must be adhered to, so as not to hold up the competition, a draw for the subsequent round will be made the day after the box by date for each round. 4. The date of the fixture must be before the box by date but can be decided by the Boxing Officers of the competing units. 6. Default venue for the Final of the competition is the Combat Sports Centre, Aldershot. The Final will be financially sponsored by Babcock International Group, with the closest qualifying Unit is responsible for supporting the event with a works party to set up the event in conjunction with the Secretary of Army Boxing. 7. 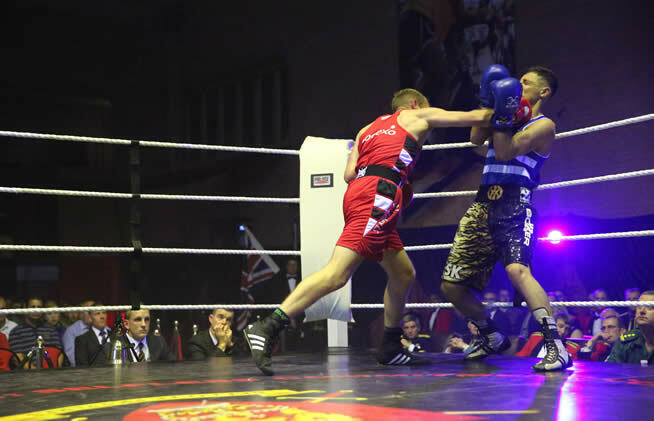 The Championships are open to regular AND reserve soldiers and officers, in the Elite Age Category (see para 9) registered in Development Class A boxers with the Army Boxing Association. All competitors must have a minimum of 2 bouts registered in their boxer’s registration book. Note: A boxer, who in the course of the Championships exceeds 10 bouts on their record of contests, may continue in the Championships as a Development Class A for the purposes of the Championships only. To remain eligible for team representation, the boxer may not compete in any other non-championships bouts until the team has been eliminated from the championships. 8. Boxers representing a unit team must be on the assigned strength of that unit and have moved and tracked via JPA by their APC CM (Army Personnel Centre Career Manager) desk for a period of at least 30 days prior to the date of their participation in the competition. There is no exception to this rule. 9. All boxers must conform to the criteria in the reference; AGAI Vol 1 Chapter 5 Part 3 – Participation. Note: Boxing officers and coaches are to note that Dev Class A and Dev Class B are Elite Boxer (Adult) Boxing categories. Junior and Youth boxing categories have A and B classes that indicate year of birth and not bout experience. (1) Junior. A junior boxer within the Army BA is deemed to be aged less than 16 years of age. Upon attaining his/her 16th birthday, an individual ceases to be a junior boxer and is classed as a youth boxer. (2) Youth. A youth boxer is a boxer that is 16 or 17 years old. Upon attaining their 18th birthday an individual ceases to be a youth and is classed as an Elite boxer. (3) Elite. A boxer who is 18 years and above to the age of 40 yrs. A boxer who turns 40yrs old is no longer permitted to box. c. Registration. All boxers must be registered with the Army BA or ABAE via UK Armed Forces Boxing Association (UKAFBA) and be in possession of a current valid Boxing Card (BCR1). Details of registration of boxers are obtainable from Army BA. d. Competitive bouts, skills bouts and previous individual physical contact sport experience. All competitive boxing bouts, all skills bouts and any individual physical contact sport experience (see below for a definition), is to be declared on registration and each boxers Registration Card is to reflect this experience. Failure to ensure that a boxer’s record card is accurate will render the boxer and the unit in breach of this rule and disqualify both from the competition. “Individual Physical Contact Sport” means any of the following sports in any of its forms: Aikido, Boxing (white collar or any boxing that can be deemed competitive), Cage Fighting, Judo, Ju-jitsu, Karate, Kendo, Kickboxing, K-1, Muaythai, MMA, Sambo, Savate, Sumo, Taekwondo, Wrestling, Wushu and such other sports as may be deemed by AIBA to be an individual physical contact sport”. 12. The Boxing Officer is to provide a team list of the unit boxing squad of up to no more than 20 boxers, the Team List available at Annex A to Section 10 of the Army Boxing Official Handbook 2017 available at www.britisharmyboxing.com, is to be signed by the Commanding Officer and passed to the opposing Boxing Officer 10 days prior to the fixture. 13. Each Boxing Officer has 7 days to scrutinise the opposition for any irregularities in registration. Any issues are to be brought to the attention of the Army BA Sec for action within the 7 day period, this allows the Army BA to investigate and adjudicate. 14. Entry form is at Annex A. Entries are to be submitted as shown below, by the closing date of 10 Nov 2017. Late entries are not acceptable. St Katharine’s & Wapping, London EC3N 4AB, timings will be confirmed on receipt of entry but the intention is to provide lunch for 2 representatives for each participating unit. 17. In recent seasons, units have entered the competitions only to withdraw at a later stage, after the draw has been made and rounds commenced. Units are requested to note the requirement to ensure availability for full participation through to the final stages of the championships. Units withdrawing after the draw has been made are to write to the Chairman Army BA (via Secretary Army BA) stating reason. 18. Entry fees are not required for the Championships due to sponsorship from Babcock International Group. 19. Travel at Public Expense for up to 17 personnel (boxers/coaches) is authorised in accordance with 2017DIN10-023. 20. Costs are to be kept to the minimum necessary to meet the requirement, with transport being shared wherever possible. Expenditure is closely monitored by the Programme Budget Wing APC Glasgow, which may challenge expenditure as appropriate. Members of both teams will receive a medal. 23. To ensure that entry to the competition is not cost prohibitive, units are not expected to feed visiting spectators with hot food in the Warrant Officers and SNCO’s mess post boxing. 24. The Army BA requests that each unit be prepared to accept the responsibility to seat up to 6 guests from the Army BA or its sponsors at any point in the competition. The hosting of any guests would be the responsibility of the Army BA but liaison between the Association and unit as to the seating plan is required. 25. During the event photographs may be taken and then published on Army Sport Webpages. In accordance with competitors’ rights under the Data Protection Act, if competitors do not wish to be named in articles or have photographs published on webpages, they are to advise the event organiser accordingly. 26. Any queries are to be directed to the Secretary Army BA.